1. They stay active: dogs need to walk, and many owners go for a walk in the morning or evening with their furry friend as part of their daily routine. On weekends, they can reach the dog park, a hiking trail or the beach to get some fresh air and a game of fetch. If you date or marry a dog owner, it is likely that these healthy habits will also affect you. 2. 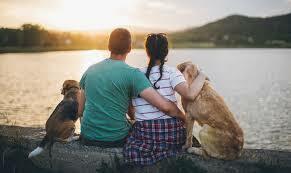 They are not afraid to commit: dog owners are not afraid of committing to a relationship because having a dog means committing to caring for the animal for the next decade or more. Dog owners are ready to sacrifice their freedom, time, money and energy to give their puppy a long and happy life. They probably have what it takes to make a lasting relationship. 3. They are patient: the puppy's stage can really test a person's patience. Dog owners have been woken up by barking, went home to chewed-up furniture, and they have done away with at least a couple of their favorite shoes, not forgetting a frustrating potty-training. The point is that dog training and grooming is not easy; is a waste of time and sometimes frustrating, but dog owner takes everything in stride. When you really love someone whether it's a dog, a romantic partner or someday a kid, it's all worth it. 4. They can handle a mess: puppies are adorable and amazing creatures, but they are messy as well. Dog owners have handled it all; dog poop and throw up in the house, muddy paw prints on the floor and hair everywhere and anywhere. Instead of freaking out, dog owners take a deep breath, clean it up and move on, so they will not lose peace when it comes to gross human things like a clogged toilet. 5. They already know what unconditional love looks like. This is because their dog gives them unconditional love, and they in returned love their dogs unconditionally. It is in them and they give it to their human companion as well. 6. They are affectionate: after a long day, there is no place they prefer than being cuddled up next to their puppy on the couch or at the receiving end of some puppy slobbery kisses. But they will happily scoot over and make some rooms for you to squeeze in between. 7. They are good caretakers: they are used to caring for someone other than themselves. Every day, they wake up, they feed their dog, and they take them for a walk and let them go out to urinate again, all before going to work. They took the sick puppy to the vet, checked ticks and fleas, and gave a lot of baths to their furry friend. Care is simply what they do best. 8. They are playful: dog owners don’t take themselves too seriously. They play with silly dogs toys; make fun little games for their dogs, and runs around Dog Park throwing a tennis ball. This sense of lightness and playful will likely reflect in their relationships as well.